Living with food allergies has become quite normal for our family. 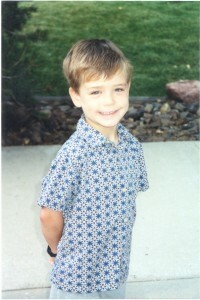 Our son, Morgan, is now 23 years old, a college graduate, and has lived with food allergies his entire life. People continue to ask us how we found out he was allergic, will he ever outgrow any allergies, and how do we live a normal life? We had all of these questions too when Morgan was formally diagnosed at 18 months old with severe peanut allergies (although he’d already had a contact reaction at 9 months old), along with many other food and pet allergies. We were overwhelmed and then some! Eating out at restaurants became a planned event; vacations were put on hold; babysitters had to be versed in the use of the epinephrine kit; and even shopping in the local grocery store required hours of reading labels on boxes. Our “old” carefree life was gone; and a hyper vigilant life took its place. We were constantly surprised at the number of times food was being offered to our son. We weren’t aware of the number of times we would have to think ahead, planning and packing a different snack. Anytime food was offered, I would tell a long story of peanut allergies, his reaction, his potential reactions…to the point of boring the other person to death. I was scared, and I wanted other people to know the seriousness of Morgan’s allergy. Using shocking words got their attention, but sometimes it only served to scare other people, and made his allergy seem to be even more unmanageable. We have found that the combination of an accurate diagnosis, a wonderful allergist, careful label reading and Morgan’s growing self-advocacy has kept him aware and even with the worst of occurrences – anaphylactic shock – he was able to identify what was occurring. He has had many allergic reactions; thankfully most have been relatively minor. We remain constantly vigilant, and aware that it takes just one mistake eating the wrong food. At 3 weeks old, Morgan contracted RSV, or Respiratory Synctial Virus. He began coughing as if he had emphysema, and by the time we got him to the doctor his pulse oximetry reading was at 82%, where it should have been at 96% in our high altitude state of Colorado. Our doctor was very concerned, sent us to the hospital for him to be admitted. He stayed two days. Thankfully, he wasn’t dehydrated and didn’t have pneumonia. We began Albuterol treatments every 2-4 hours around the clock for three weeks. Additionally, he was put on oxygen for three weeks to help his body breath! It was a frightening time, yet he continued to gain weight and nurse well. Seemingly, he suffered no long term consequences; albeit some would say his asthma diagnosis from young childhood sourced from this virus. From his first few months, Morgan had severe, weeping eczema across his body. It was everywhere – behind his knees, on his hands and feet, and even behind his earlobes. His skin was constantly infected, and I coated him with Eucerin® lotion and steroid creams to not much avail. I didn’t realize that eating peanuts while breastfeeding could be affecting him. I nursed him for 8 months, eating peanuts, tree nuts, and shellfish…everything that he later turned out to be allergic to! Our pediatrician didn’t mention anything that I needed to change, and just encouraged me to continue nursing, especially after the bout of RSV. We found out that Morgan had some kind of allergy to peanut butter when he touched it for the first time at 9 months old and got hives up his arms and across his face. I called our primary care physician immediately who told me to administer Benadryl® and keep the peanut butter away from our son. Thankfully, he didn’t eat any of the peanut butter, or we would have been rushing him to the emergency room. He had what is referred to as a contact reaction. Just touching peanut butter was enough to elicit an allergic reaction. It scared us to death! When Morgan got his 15-month old shots including the MMR (measles, mumps and rubella) the doctor asked if he had ever eaten eggs since the shot was egg-based in 1997. With the peanut reaction in the back of our minds, we had never given him eggs for fear of a similar allergic reaction. At 18 months old, he underwent the skin prick testing and we confirmed he has a life-threatening allergy to peanuts. Skin prick testing involves pricking the skin just slightly and then adding a drop of the serum inside the scratch. A patient must remain still for 15-20 minutes to allow any reaction to occur. We found out a 0 on the test meant no allergy, while a 4 is a severe allergy. The allergist tested mainly for food and pet allergies because she said the airborne allergies such as pollen, weeds and trees probably wouldn’t show up until he was older and had been exposed to the offending item more. Morgan scored a 2 on eggs on the allergy scale, a 3 on dogs and a 4+ on peanuts. He had another smaller reaction to soy. The allergist gave us information on how to read a label to check for eggs and peanuts. She suggested that we keep our son away from tree nuts because of the potential cross reactivity with peanuts. And we shouldn’t feed him shellfish because of the allergic potential of that food also. She gave us a prescription for an EpiPen® Jr. and suggested we get Morgan a Medic Alert® bracelet. She demonstrated how to use the EpiPen® Jr. should we need to use it. She noticed he had severe eczema on his hands and mild eczema behind his knees, and even under his ears! She thought this was caused by him eating foods that he was slightly allergic to, such as soy. My experience with doctors and food allergies is that they can diagnose the allergy; however they have no experience to share concerning living with the allergies on a daily basis. Therefore, I at first didn’t see the significance of a potential anaphylactic reaction to peanuts. I began to read labels, but since my son was only 18 months old, he really didn’t eat a varied diet. We rarely ate out, he wasn’t yet involved in sports, he didn’t go to day care, so the reality of the peanut allergy didn’t take hold for us. Our doctor didn’t tell us what it would be like to try to find a preschool, a Sunday school program, or how to deal with snacks at soccer games. We were luxuriating in our ignorance, and in our closed little world. About this time, I met a woman who had a son 8 years older than mine with mild peanut allergies. She said he couldn’t eat peanuts, but there were no more restrictions in place concerning peanuts at her son’s school. She said he still ate M&M’s, and that he threw up a peanut butter sandwich that he was accidentally fed. I knew that Morgan had gotten hives from touching peanuts upon his first exposure, but I began to hope that maybe his peanut allergy would become equally as mild. Wouldn’t it be nice, I thought, to not have to single my son out for a safe snack; to not have to request that all nuts be removed from his school classroom…I began to hope that he could have a ‘normal’ childhood. Even in this denial stage, I began to develop a support system on the Internet. I began to talk with and write to other parents dealing with potential anaphylaxis. Talking with my neighbors about Morgan’s diagnosis didn’t give me alternative methods for dealing with his allergies. I needed to speak with parents dealing with my same issues to come up with new solutions. Also, I needed to share our joys and sorrows along the path of life. My friends who didn’t have a food allergic child couldn’t understand my consternation over preschool and kindergarten. When I shared this with other parents of food allergic children, they understood exactly my fears. I began to search the Internet for research on why my son had food allergies. I wanted to know the cause, and what I had done wrong. Surely I must have eaten too much peanut butter while pregnant or nursing, and therefore had created him having allergies. I had fairly severe pollen allergies as a child, a couple of hives reactions from unknown causes, and severe eczema. I assumed that my genetic allergy mapping was passed on to him. In analyzing the ‘why’ of his food allergy, I found that I needed to practice more precautions. The cookie at the grocery store wasn’t safe if I didn’t know the exact ingredients. I wasn’t willing to risk an accidental exposure, especially since I hadn’t been zealous in carrying Morgan’s prescribed EpiPen® Jr. I started coming out of denial when I ensured that everywhere he went, his EpiPen® traveled with him. I continued with questions as the fog lifted: How was I going to feed this child? I also jumped into the future and wondered how he would ever go to school? I wasn’t even wondering about preschool, I was wondering about college! We would give Morgan a dose of Benadryl® before he went to anyone’s house that had a dog once we found out he had an allergy to dogs. Thankfully, we did not own any pets, other than fish! We didn’t face the hardship of having to decide what to do when you’re child is allergic to the family pet. Even with the Benadryl®, Morgan would still get swollen eyes within an hour of exposure and began having asthma like symptoms every time he would get a cold. It became obvious that he could no longer go to anyone’s house that had a dog. Even though he scored a zero (0) on the allergy tests to cats, he began to develop an allergy to cats. It escalated to the point where his eyes swelled shut one night at a friend’s house after 10 minutes of exposure to cats! We completely stopped his exposure to animals, and began administering the asthma preventative drug, Intal, through a nebulizer. Morgan quickly stopped having bronchial spasms with every cold. His pet allergies could possibly be mitigated with allergy shots in the future, but at that point, we felt it was safer to keep him away from animals entirely! 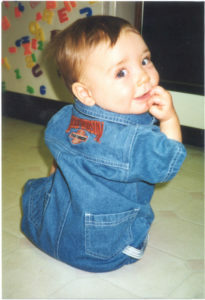 At 3 ½ years old, Morgan went through his second series of allergy testing. We wanted to recheck the peanut, egg and pet allergy. Also, we wanted to add tree nuts and shellfish to the allergy test. Morgan had a bad hives reaction to dandelions upon touching them one summer and we wanted to test for that. However, our allergist did not have a test for dandelions specifically and instead suggested we have him not touch them in the future! This skin prick test showed that he was no longer allergic to eggs. However, he was still as allergic to peanuts (a score of 4+), and we found out he is equally allergic to shellfish. He is somewhat allergic to almonds and walnuts, and severely (a 4+ score) allergic to cashews. Our allergist suggested we keep him away from all tree nuts and not try to figure out which ones are safe and which ones aren’t. The chance of cross-reactivity between the nuts is very strong, and the machines used to process one nut are often used to process another nut. It would be safest to stay away from all nuts entirely. He still showed a severe reaction to dogs, now a score of 4 on the allergy scale, and a 3 to cats. We wondered about testing for food dyes, as Morgan seemed to be reacting to ‘kid foods’ like popsicles and candy. He had constantly red cheeks, and his eczema was out of control! We thought that it might be sunscreen used in the summertime. Then we discovered that he ate more popsicles and candy in the summer also! Our allergist stated that there wasn’t a test for food dyes. She called it an intolerance, and told us to remove food dyes from his diet and see how his skin fared. Magically, the terrible fissures and eczema spots began to clear up! They didn’t entirely disappear. The eczema would only show up on his pinky finger when he ate a ‘forbidden food’! We removed food dyes from his diet to the best of our abilities, only allowing him the occasional treat with food dye. Morgan has had one bout of hives that we could never determine the cause. 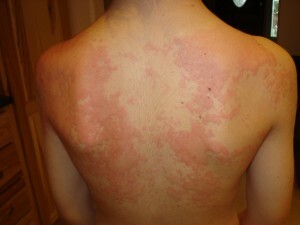 He had severe hives all over his body for an entire day after eating at McDonalds. He never had breathing problems, just the hives. Morgan had eaten the same thing (Happy Meal with chicken nuggets and French fries) for a year every time we visited McDonalds. I called McDonalds and obtained a faxed copy of their list of ingredients in all of the items he ate, including ketchup. They also sent an explanation of how they prepared their foods, i.e., in vegetable oil. They hadn’t changed anything in their preparation process or the ingredients in their foods. We never did find out what caused his hives, but began to suspect sesame seeds. McDonalds now has all of their ingredient information on their Web site. Our allergist said that a child with severe food allergies is very likely to have incidences such as this. It was very scary, and thankfully did not put him into the ER or hospital. A large dose of Benadryl® solved the problem, but it did have to be administered every 4 hours for the entire day. Morgan went through a third skin prick allergy testing in December 2000 (at almost 5 years old). We wanted to find out if he had any other fur allergies (thinking about kindergarten classroom pets); and whether he was developing any environmental allergies. We also tested his previous known severe allergens: peanuts, cashews, shellfish, cats, dogs. All of these came back at a 4+ (severe allergy), and we added two more items to this list: sesame and horses. We found out he is moderately allergic to gerbils and to sunflower seeds. He was developing environmental allergies, especially to some trees, which were at a 4+. Other grasses and weeds were also climbing. Our allergist predicted that Morgan would need to begin allergy shots within a few years, once his eczema clears up. She also put him on an inhaled steroid (Pulmicort) to try to combat his repeated rounds of bronchitis through the fall. He hadn’t been exposed to pets, which was the cause of the bronchitis before. We believed the weed allergies were affecting him. Also, with four days a week spent at preschool that school year, he was being exposed to more germs. Immune system build up sure is hazardous! 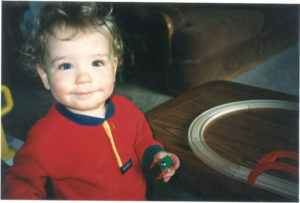 When Morgan was 5 ½ years old, we decided to have a RAST (Allergen-specific IgE antibody test) completed. This test is less invasive, since it only requires blood to be drawn. It is much more expensive; however, so we made sure our insurance would cover it. The results of the RAST test were fairly similar to the previous skin prick testing. The RAST scoring goes from a Class 0 which is a negative result to a Class VI, which is as high as it goes. Class I and beyond show increasing levels of Specific IgE Antibody. Morgan showed a Class II on cats and sunflower seeds, Class IV on dogs, horses, sesame, cashews and peanuts. They were able to break out the shellfish panel into results for the various types of shellfish. Morgan scored a Class III on Clam; and all the others (crab, shrimp, scallop, oyster and lobster) were Class I or 0. We are still staying away from all shellfish, just to be on the safe side. This testing was completed the year Morgan was in kindergarten. His school year was a great success in that he had no reactions at all! He had no pets, nuts or seeds in his classroom. A nut free table was provided in the lunchroom for him, which worked great. His medicine was switched during the spring of kindergarten to include Singulair instead of keeping him on the Pulmicort inhaler. That worked very well. He builds up intolerance to certain meds after being on them for some time. Inhaled steroids year round didn’t seem to be necessary, and that allows them to be used to chase away a cold, and prevent it from becoming bronchitis. In October of 2002 (at almost 7 years old), Morgan had yet another blood test. The Immunocap is a type of RAST test that utilizes Pharmacia equipment. This is a specific type of RAST test. Dr. Hugh Sampson, one of the foremost food allergy researchers, has developed positive predictive values and negative predictive values for this test. The test did show that everything we suspected that Morgan is allergic to (peanuts, tree nuts, sesame and shellfish) still showed positive. We were able to determine that he’s more allergic to pecans, cashews and walnuts, than he is to almonds. He is only ‘mildly’ allergic to peanuts by this test, scoring a 2.2. However, the Immunocap still shows him very allergic to egg whites, which showed as a negative before on the skin prick test! And shrimp is the only shellfish he shows positive to. The results of the test didn’t allow us to change Morgan’s diet at all; however it did illuminate more of his allergies to us. Because of Morgan’s previous problems with the MMR vaccine, we decided to administer the chicken pox vaccine in the allergist’s office. We had debated whether to have him receive this vaccine at all. With his eczema, our allergist suggested that the vaccine would be preferable to him having what would likely be a more serious case of chicken pox. The combination of eczema and chicken pox sounded terrible, so we opted for the vaccine. Morgan had no immediate reaction to the shot. However, within 6 hours of receiving the shot, he began vomiting every 15 minutes. He became severely dehydrated, and we took him to the emergency room. They had to re-hydrate him through an I.V., and he remained in the ER overnight. For the next two days, he was horribly ill.
Our allergist is convinced this was a reaction to the shot. He never exhibited hives, yet we learned that allergic reactions can take on many different symptoms. We have not determined what ingredients in the shot created the reaction. During the summer of 2003, Morgan had two fairly serious reactions. The first reaction was after eating an ice cream bar that we had purchased before, and that he had eaten before. This time, I had forgotten to re-read the label, and Morgan ate the ice cream bar. Soon after, he turned an ashen gray and had a bad stomachache. I grabbed the box and realized that it now said, “May contain peanuts” on the label. The manufacturing process had changed, yet the box looked exactly the same as before! I dosed Morgan immediately with Benadryl®, and thankfully he didn’t have a further reaction. I learned a valuable lesson to read the label EVERY TIME! The second reaction was on a bike ride when a puppy came up and licked Morgan’s arm. In the 10 minutes it took for us to get home, hives covered his arm. The itching was severe, and a double dose of Benedryl® was necessary. Also, we washed the area and applied Sarna, an anti-itch cream. Thankfully, no epinephrine was required with either of these reactions, since no breathing problems occurred. With the hopes of finding a way to decrease Morgan’s allergies, we took him to a nutritionist. This nutritionist was also a hematologist, and therefore asked that Morgan have blood drawn for multiple blood markers beyond just eosinophils and IgE. We found that Morgan’s IgE is above 600, which really isn’t that bad considering the number of allergies he has. Yet a normal IgE is below 300 for a child his age. His eosinophils are above 1000, which is very high. His eczema is probably causing these two counts to be high. He also has a sluggish thyroid and elevated liver enzymes. The nutritionist believes these two items could suggest a gluten sensitivity, and suggested a gluten-free diet! You can imagine Morgan’s dismay at being told he needed to remove gluten from his diet also. He has so many limitations on his foods, that it was really difficult to ponder this. Yet, we forged forth in an attempt to find some way to assist Morgan’s immune system to get stronger. We got various suggestions for cooking gluten free, and received a ‘recipe’ for an intestinal mucosal lining rebuilder to help repair his stomach and intestines. Some of the vitamins suggested, such as black currant seed oil did not set well with Morgan’s system. We added some vitamins, such as Vitamin C and a multi-vitamin to his diet. We are very careful about any type of vitamin since his system is so sensitive, and we certainly don’t want an allergic reaction. Mainly, we’re trying the gluten free diet and adding a lot more protein to his meals since protein mops up toxins. My husband regularly takes our two kids camping every summer in the Rocky Mountains about a 4 hour drive from our home. They camp at 10,000 feet far away from everyone and far away from cell service! Morgan experienced his first anaphylactic episode to Rocky Mountain trout in this wonderful location. Thankfully, everyone in the family knew what to do, and Morgan lived to tell about his experience. 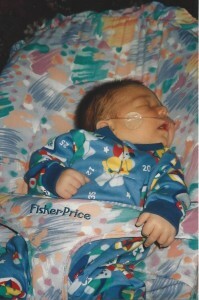 Read about Morgan’s story in his own words in the Fall 2006 issue of Allergic Living here. One month after the anaphylaxis, our allergist suggested that we go ahead and have another skin prick testing done. We wanted to test for fish especially, in addition to his other food allergens to see if anything had been outgrown. He had previously tested negative to a fish mix which included cod, halibut, flounder, tuna and mackerel. Our assumption was that he would remain non-allergic since he hadn’t eaten any of these foods because of their proximity to shellfish in display cases. Instead, the anaphylaxis made us doubt this assumption. The allergy testing was a miserable event. Even with the serums for peanuts, tree nuts, sesame and shellfish diluted 1:200, Morgan experienced horrendous reactions. He also exhibited severe reactions to trout, tuna and salmon. No longer can we say he isn’t allergic to fish! He continues to also be severely allergic to dogs and cats. There was nothing that he has outgrown, and all of his food allergies appeared to remain constant – and severe! The allergist had the most severe allergens skin prick tested on his forearms so that a tourniquet could be applied should the reaction get out of hand. When he began to have satellite hives up his arms, she decided to give him a shot of epinephrine in addition to 50 mg of Benadryl. We remained in her office for 30 minutes after the testing was completed to ensure the reaction was subsiding. Thankfully, it did. We now know to have only allergy blood testing completed in the future. He has far too many allergies and too severe of reactions to put his body through skin prick testing. In November of 2006, our local newspaper, the Gazette interviewed Morgan for a story on food allergies. To read this article click here. After repeated rounds of colds, stomach bugs and other viruses, we began to suspect that Morgan’s immune system wasn’t working properly in the winter of 2006-07. I reviewed the skin prick test that was completed the previous summer and realized that rice was tested, and came back as a 2+. A gluten free diet consists mainly of rice and rice products, and Morgan had been eating rice every day for 6 months. Our allergist and I spoke, and she agreed that eating rice every day with a moderate allergy could create such a problem with the immune system. The nutritionist’s idea of a gluten intolerance turned out to be untrue, because once Morgan went back on wheat – he felt much better. His immune system began to fight off viruses. It’s amazing how even the moderate food allergies can have an impact! One Monday morning Morgan awoke feeling fine. Ate breakfast, took a shower, got out of the shower and began to feel his eyes swell and become extremely itchy. At first, we thought he must have gotten shampoo in his eyes, so we washed them with saline eye drops. He had used the same shampoo for a year, so we didn’t think he could have become allergic to it. His eyes continued to swell, so we put in Optivar eye drops. This didn’t help much either. He had no other symptoms of an allergic reaction, but soon his eyes were bulging and swelling to the point he could barely keep them open. I gave him a Claritin in the hopes that everything would calm down, and he would be able to attend school for the day. Of course, Claritin is not a fast-acting antihistamine, so relief wasn’t immediate. In the meantime, we scheduled an allergist’s appointment and went immediately to the doctor’s office. She quizzed us on what could possibly be the cause. The only thing that we could figure is that Morgan touched something that he was allergic to and then touched his eyes. The rest of the family had barbequed grilled salmon for dinner the previous evening (cooked outside), and maybe a piece of fish had been left on the counter. We are fastidious with our cleaning methods around fish, yet there was always a possibility that we missed something. The allergist administered 2 teaspoons of Benadryl®, and suggested we do the same every 4 hours throughout the day. She also gave us a prescription for steroid eye drops to bring down the extreme swelling. Morgan would have to miss school, and be monitored for the rest of the day. The reaction began to subside with the Benadryl®. We never completely figured out what caused the reaction, and were VERY grateful it never went beyond his eyes. We will be even more careful around cooking fish, and cleaning up the dishes! Morgan wanted to make some money after learning how to use the lawn mower during the Spring of 2007 (at age 11). We agreed he’d have to mow our lawn first and do it well before mowing for anyone else. After two weeks of mowing our lawn, he began getting hives around his neck, arms and legs right after mowing. We had him wear a mask so that he wasn’t breathing in the grass clippings. However he soon got what appeared to be a cold that immediately went into wheezing and bronchitis – probably due to the grass pollens he was breathing, even with the mask! This began a series of pollen-related reactions for him. His eyes were almost continually swollen despite eye drops, and Claritin wasn’t even beginning to quell his constant runny nose. He ended up with an upper respiratory infection requiring antibiotics, Albuterol and Pulmicort to rid him of the bronchitis. This put an end to his potential lawn mowing business! 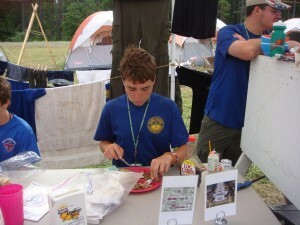 Morgan left for Boy Scout Camp in the Rocky Mountains during June of 2007 for one week. We sent up an arsenal of medicines with him, including steroid nasal spray, a steroid inhaler, Claritin, eye drops and of course his EpiPen along with three extras, just in case. I prepared all of Morgan’s foods for him to take to camp. The camp cook kept the foods either in the freezer or in the refrigerator and then heated them in a microwave prior to a meal. By the last night of camp, Morgan had eaten through all of the dinner vegetables I had prepared – growing boys outdoors eat more than I knew! The camp cook offered to prepare broccoli for Morgan in the camp kitchen for dinner. Within 30 minutes after eating that meal, Morgan began to have severe stomach cramps and headed to the Medic’s cabin. The Medic wasn’t sure if it was an allergic reaction or dehydration, because there were no other allergic symptoms such as hives, wheezing or itchiness. My husband and I received a phone call from the Medic and Morgan explaining the situation. The Medic had given Morgan Benadryl® and some water, and wanted to know if we wanted to pick him up from camp. We decided instead to have him monitored continuously in the Medic cabin, and to call us every 20 minutes for the next hour, especially since there were no breathing difficulties evident. After an hour, Morgan was feeling good enough to stay at camp for one more night, until the end of the camp. We never did figure out what caused this reaction. It could have been some food allergen that crossed with the broccoli, or the peanut butter that some other kids were eating at another table in the cafeteria (highly unlikely), or just dehydration. That’s the real issue with food allergies for us – not always do we know EXACTLY what causes these strange reactions! Morgan came back from Camp with extremely swollen eyes, eczema all over his body and dirt caked on top of that! These issues were probably due to the pollen in the air, and when camping outdoors that is a hazard. We began a twice a day regimen of Elocon steroid cream with Eucerin paste lotion on top. He had his annual eye exam scheduled a few days after his return from camp, and the eye doctor wasn’t able to get an accurate read of his vision because his eyes were so swollen. Even the corneas were swollen! Morgan was put on steroid eye drops and antihistamine eye drops for the remainder of the summer, which began helping immediately. He also was put back on Singulair for the remainder of the summer. Morgan hadn’t had an Immunocap RAST blood testing since 2002. With his skin prick test the previous summer being a disaster of a reaction, our allergist wanted to pursue a blood test to confirm the skin prick test results. Many foods increased in their IgE level from the last Immunocap test, even though Morgan hadn’t eaten them. His highest allergen appears to be pecan at a 23. Surprisingly peanut decreased to 1.47, yet his skin prick test had to be halted because of the severity of the reaction. It’s difficult to find the meaning of that! We also tested for latex, and received three separate test results to the surprise of our allergist. Generally, the latex results are reported in just one number. Instead, we received a number for Ammoniated Latex, Buffered Latex and Glove Latex. The Buffered Latex was a 12, which is high. The other two were negative. Yet Morgan has never appeared to have any reaction to anything with latex. At this point, we will watch this very carefully. Our allergist did tell him that “when” he becomes an allergist himself, he will want to use non-latex gloves in his office! Because of Morgan’s severe pollen allergy reactions during the summer of 2007, our allergist suggested beginning allergy shots over the winter of 2007-08. Morgan had to withstand another skin prick testing for grasses, weeds and trees in order to develop the allergy shot serum. Apparently, the blood test results for pollen allergies to develop an allergy shot serum aren’t as accurate. The allergy testing was miserable, because of all the high scores and welts that appeared. For 3 days, Morgan’s skin remained itchy and welted, but we were ready to begin allergy shots in the fall. We began our preparation for Middle School in the spring prior to the 5th grade year ending. 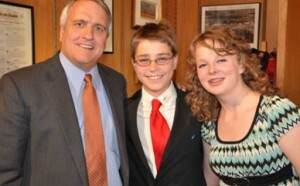 We met with the principal of the middle school, along with the teachers Morgan would have, and his 6th grade counselor. The elementary school passed the baton – so to speak – over to the middle school by providing information about what has worked with a nut-free classroom and a nut-free table in the lunchroom. Morgan was able to share what works for him, and we discussed having his locker near his pod of classrooms so that teachers could monitor other kids and potential food hazards coming out of lockers! Once the 6th grade school year started, all of the teachers that had been assigned to Morgan had changed! Yet, our school district had created a Food Allergy Task Force during the spring of 2007 to create guidelines for schools to deal with students with life-threatening food allergies. These guidelines were to be followed for all students beginning in the 2007-08 school year. This made the transition to middle school even easier. We met with Morgan’s teachers during the first week of school, and discussed foods in the classroom. Since there were three other severely food allergic children on his team, the teachers had determined that no foods would be allowed in any classroom. What a joy middle school is! There would be no holiday parties, no birthday celebrations, no food given as a reward, and no morning snacks! That made the meeting with the teachers exceedingly short. The lunchroom had a nut-free table, and all four of the 6th graders with allergies sat there along with their friends. Morgan said that many times, there were so many people at the nut-free tables, that it was difficult to find a seat! That’s a preferable problem to sitting with no one during lunch. He wrote an article about school lunchrooms for Allergic Living magazine, for their Fall 2007 issue. CLICK HERE to read the story. Morgan received his first allergy shot on a Friday, the end of August in 2007. He appeared to suffer no severe site reaction to the shot. Yet, he had been battling a stomach ache earlier in the week, and that resurfaced after the shot. He also had the feeling of a cold coming on, which could have been a coincidence or the fact that he’d been back in school for 3 weeks allowing germs to infiltrate his system! The following week, he got hives and a rash on his ankles walking to school. He called me from school asking me to bring in his steroid cream. With pollen counts still high in August, our allergist decided to cease allergy shots until we experienced freezing weather. Having an allergic reaction to the pollens in the air is significant, and adding allergy shots may have pushed Morgan’s system over the edge. We certainly didn’t want an anaphylactic reaction to an allergy shot. Two weeks after receiving the first allergy shot, Morgan awoke on a Monday morning covered in hives. He had no breathing difficulties, felt somewhat tired, yet had no other symptoms than severe hives. Once again, we headed off to the allergist office. By the time we arrived there, the Benadryl® we had administered had taken effect, and the hives were gone. However, the doctor checked him out thoroughly and determined that a blood test was in order to see if his white blood cells were elevated (indicating a virus) and to see if he possibly had strep. She also tested for a few more foods that he had eaten the night before, which were not standard in his diet. These foods were garlic, onion, and red pepper. 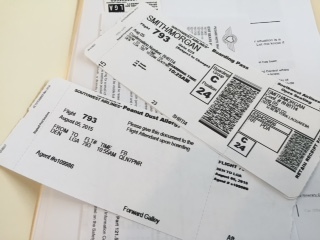 She gave him a prescription for Prednisone and Zyrtec. The steroids took a day or two to get into his system, and in the meantime he would erupt in hives every 3-4 hours for two days. He was miserable! The Prednisone lowered his immune system, and within a week he had a severe cold! All of this at the start of 6th grade meant he was missing a lot of school. We became detectives trying to figure out what was causing his immune system to become so overloaded. The blood tests revealed a normal white blood cell count, and no strep. However, he did test positive to garlic, onion, red peppers and rice – all were a Class III on a RAST test. Yet, our allergist really believed that he had a virus, and that the foods eaten may have pushed his immune system over the edge. A week after going off the Prednisone, Morgan had another rash appear. This one was itchy, and had a sandpaper like feel to it. I suspected scarlet fever. We headed to the doctor for a strep test which once again came back negative. The allergist thought it was viral yet again. After 3 days, the rash disappeared. By this time, Morgan was spooked as to what was occurring with his body! We couldn’t imagine that all of these rashes were caused by receiving one allergy shot. Yet, everything began after that. The allergist suggested that we skin prick test Morgan for the glycerin solution that preserves the allergy serum, which came back negative. We visited with a chiropractor who practices sacro occipital technique (SOT), and he worked on Morgan’s energy fields. It’s a strange science/art, yet Morgan began to feel much better afterward. Puberty is beginning, which can have strange effects on the immune system. 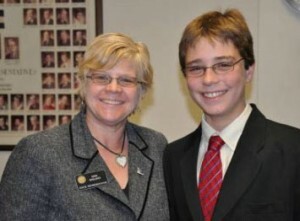 Morgan had the opportunity to testify for a bill in Colorado, SB09-226 “Concerning Policies for the Management of Food Allergies among School Children” the last week of February 2009. This was quite an opportunity since I had been working on getting this legislation introduced for the previous 2 years! Senator Paula Sandoval sponsored the legislation, which passed the Health & Human Services Committee by a vote of 8-0. One Senator told the audience prior to his vote that he was intending to vote “No” on the legislation until he heard the compelling testimony of parents of food allergic children and Morgan. He realized that there were many other food allergic children across the state whose parents were trying to keep them safe at school each day! That is a victory, especially since this particular Senator is renowned for voting “No” on virtually every piece of legislation. 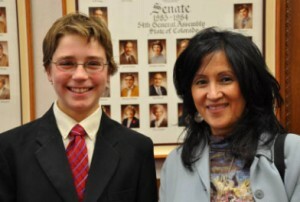 In April 2009 Morgan went back up to Denver to our state capitol to testify. This time, the bill was going through the House’s Committee on Education. Morgan used his same testimony with some altered sentences and added in some words because “Mom” didn’t testify this time. Representative Gagliardi sponsored the bill. The process of getting the bill through the Committee took about 2 hours. It passed 10-3. In honor of Food Allergy Awareness Week in May 2009, Governor Ritter signed Senate bill 226, requiring all 178 Colorado school districts to develop and implement a policy for food allergic students. Click here to view the final Act. 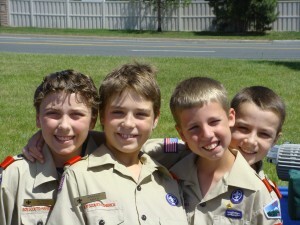 After attending Boy Scout camp over the summer of 2009, Morgan came home with eczema on his ankles. This was probably due to grasses and weeds rubbing against his exposed skin while wearing shorts. We continued to apply lotion and steroid creams, to little avail. We started Morgan back on Singulair in the hopes that it would be the miracle cure that it had been in the past for his eczema. This time, it wasn’t helpful in the least. By December, his skin was so infected it required two rounds of antibiotics to even begin to clear it up. We began wet wrapping his skin. This involves applying steroid creams, Eucerin paste and then wet wrapping his legs and ankles with gauze. He would then put on cotton socks or an ace bandage over the wet gauze. This certainly helped, but the antibiotics helped the most. We also began using a fungus cream because it appeared he had that going on also! With MRSA (Methicillin-resistant Staphylococcus aureus) infections out in the community, we have tried to be diligent in not allowing his skin to get so bad. Yet, it happened anyway! After three years on allergy shots for grasses, weeds, trees and pets, Morgan began noticing a lot less nasal symptoms with environmental allergies in the spring and summer. He was visiting friends who owned pets and able to stay in their houses for up to an hour without any symptoms. Then, he had the ultimate experience of taking care of a neighbor’s cat and dog while they were away on vacation. He still wore gloves to handle the cat food, because of fish allergies, but other than that he experienced no allergy symptoms. He is also now able to mow our yard and several neighbors’ yards – a lawn business was born! 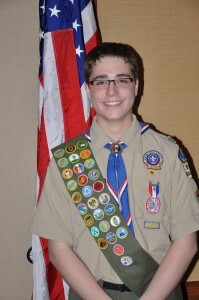 For two years, Morgan prepared for the 2010 National Boy Scout Jamboree by attending meetings, going on campouts, fundraising and meeting the other Scouts from our area also attending. The Jamboree had 45,000 boys and men in attendance all camped in 144 square miles on a military base in Virginia for 10 days. Food was going to be an issue! A few months prior to the Jamboree, we realized that we weren’t going to be able to obtain ingredient labels for all of the foods served. Menus were provided, and no peanuts were to be served. However, tree nuts were to be served, and there was no guarantee about cross contamination. We didn’t feel it was safe for Morgan to eat the food, especially if we weren’t able to obtain the names of the manufacturing companies and call them prior to the trip. We weren’t going to give up on this opportunity for Morgan to attend the Jamboree, so we decided to have my husband prepare all of Morgan’s food in a local hotel (with a kitchen) and take it to the Jamboree. This was quite an undertaking, but it worked great because of my husband’s planning skills and willingness to go to any lengths for Morgan to participate! Morgan toured Philadelphia and Washington D.C. on either side of the Jamboree adding another 7 days to his trip. This part of the trip was done with his Scout troop, but no parent in attendance. At 14 years old, we felt that he was old enough to take on this wonderful opportunity and to be able to advocate for himself should food issues arise. Preparation was still necessary however. Prior to the trip, we obtained a listing of every restaurant, military base or catering business that was to be the location for a meal. Morgan and Mom called every one of these places to ensure that a safe meal could be prepared or purchased. We got the names of the head chef, contact person or owner and listed all of these on paper for Morgan to take with him on the trip. Everything went wonderfully with no allergic reactions, even when a meal ended up not being at the exact location that was planned. He was able to utilize his years of experience with food allergies to ask for an appropriate, safe meal. He had the best time ever on this trip! Morgan’s high school is the only public high school on a military base in the world. It requires a background check for parents to even get a pass to get on the base! For the first time in his education career, Morgan rode the bus to and from school. While there isn’t supposed to be food on the bus, inevitably there are crumbs. This type of exposure hasn’t affected him though. What affected him the most was that students can eat food just about anywhere in the school and at anytime. We have continued to have a meeting with all his teachers just prior to school starting to explain how to operate an EpiPen and what accommodations Morgan still needs in the classroom. Morgan still has a 504 Plan and a Health Care Plan. Some of his teachers opted to just remove food entirely from the classroom, even though we didn’t stipulate that in the 504 Plan. Only a few high school teachers through the years have allowed safe foods (none of his allergens) in the classroom, because many teachers have enjoyed not having the mess of food to clean up! Homecoming dances, after-school activities and clubs have all required different self-advocacy. Morgan has done great with this transition into being a young adult. We wanted to see if Morgan could begin to eat eggs in the form of scrambled eggs. We knew he could eat baked eggs without a problem. Our allergist felt most comfortable sending us to National Jewish Hospital in Denver to visit with Dr. Fleischer for this challenge. Prior to being able to go through a food challenge, it was necessary for Morgan to have a blood test and a skin prick test to ensure these foods were non-reactive or only minimally so. Morgan passed those tests with no problems. He didn’t do so well on his lung function test however! Our allergist had thought that Morgan had outgrown his mild asthma, and Morgan was no longer on any type of asthma medication. But the nitric oxide asthma test clearly showed that his lungs were not functioning well. 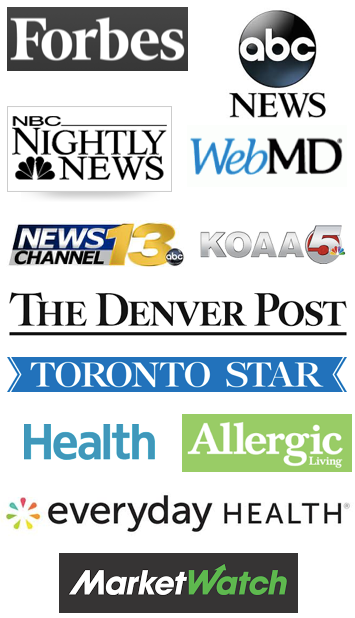 Pulmicort steroid inhaler was once again prescribed, and Dr. Fleischer told Morgan that managing his asthma well was vital since he has life threatening food allergies. The combination of food allergies and asthma makes Morgan more likely to go into anaphylaxis, and if his asthma is not well managed then he’s really in danger! Morgan went in as an outpatient to National Jewish Hospital on two separate days to food challenge eggs on one day and pinto beans on another. Warning: a food challenge should never be done at home! Hospital settings are vital in case of a serious reaction. Morgan was able to tolerate all the eggs in small doses that increased incrementally through the day. However, the next day he had a stomach ache! He decided that while he might be able to eat scrambled eggs, he didn’t feel like it anymore! Pinto beans were a success in every way, and he’s now able to add them to his diet. Dr. Fleischer thought that the only reason why Morgan had tested positive to a bean mix in the past was because of their botanical similarity with peanuts. Who would have thought that allergies could affect getting braces?! Never before had Morgan had anything in his mouth other than a dentist’s fingers! Getting braces required us training the orthodontist how to work Morgan’s EpiPen® just in case of a reaction. Thankfully, the orthodontist took the training very seriously as did the assistants in the office. Then, we had to ask for non-latex elastics since Morgan has a latex sensitivity that we don’t want to elevate into a latex allergy. Our orthodontist exclusively uses non-latex gloves so that wasn’t an issue. The braces went on without a problem, but you can never be too sure! Since he was in grade school and joined Cub Scouts, Morgan’s goal has been to become an Eagle Scout. It hasn’t been easy to manage food allergies and campouts and all the other Boy Scout activities through the years, but it was SO worth it when Morgan received his Eagle Rank! A lot of effort and appreciation goes to his Dad, who created safe alternatives along the way and thoroughly enjoyed being involved with Boy Scouts. Read the Eagle Scout Profile, from the Winter 2012 Eagle Scout Magazine, about Morgan’s awareness efforts in Boy Scouts here. Morgan had the opportunity to go to overnight camps for a week or more, to participate in after school activities, go to Prom and Homecoming, participate in the Forensics (Speech/Debate) team with overnight trips, play piano as the accompanist for the high school Jazz Choir, mountain bike … basically, he was a real boy! He became assertive in ensuring his safety around food. He watched the cafeteria at school carefully and always sat in his nut-free zone as a young boy. He had friends who joined him daily, so he always felt included. In 8th grade, he felt comfortable sitting outside of the nut-free zone tables with a group of friends that understood his food allergies. In high school, the students were allowed to eat anywhere on campus. He and his friends ate near the choir room. It was a smaller group of friends who all knew about his food allergies. He felt most safe there. Morgan had received only one vaccine since his Chicken Pox vaccine fiasco – the diphtheria, pertussis(whooping cough), and tetanus vaccination during high school. Thankfully that vaccine caused no reaction. We decided to give him that vaccine since whopping cough was rampant in our area. When contemplating the various new vaccines that were being encouraged for college including the HPV (Human papillomavirus) and the Meningitis vaccines, we decided to consult our family physician and Morgan’s allergist. Both agreed that Morgan’s past experience with vaccinations was enough to create serious concern with a potential allergic reaction. Since Morgan was planning on living in the dorm, the Meningitis vaccine was strongly encouraged. I did my homework and found that, in 2014, only one vaccine was available and it didn’t cover all the types of Meningitis. In fact, it only covered 60% of meningitis cases. We ended up deciding, along with the help of our doctors, that we would not risk vaccinating Morgan unless there was a case of meningitis at his college. From the time Morgan was a small boy, we worried about sending him off to college. Eating in a dorm cafeteria is comparable to eating out three times a day! The chances of cross contact with his allergens is very high. Since his sister, Michaela, is 5 years older than he, we had the experience of visiting colleges years before he even went to high school. We saw how little college chefs knew about food allergies back in 2008. (Things have gotten better over the years!) Yet, there were those few colleges that had taken on the safety of students with food allergies and really wanted to do well. One of those schools was the University of Denver (DU). Michaela had attended a music camp at DU when she was in high school. We were so impressed by the willingness of the chefs to provide her safe food (read her story here). We believed that would be about the only college in Colorado that could provide Morgan a safe learning experience while living on campus. (Morgan wasn’t interested in attending a school outside of Colorado, and who would want to leave beautiful Colorado?!) The only problem – DU is a private school with a hefty price tag. 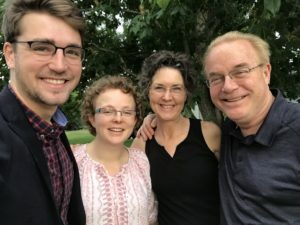 Our prayers were answered beyond our wildest dreams when Morgan won a Boettcher Scholarship which awarded him a “four year full ride” scholarship to any college or university in Colorado. He chose DU! I have written several blog posts about the preparations necessary, and Morgan’s ongoing experience with college. You can read those posts here. It has certainly been an adjustment for all of us; however, food allergies have turned out to be the least of the adjustment! The preparations we made to meet with the chefs prior to the school year starting, and getting an A/C unit in his room has mitigated all the problems with food and asthma flares. Morgan has the name and cell number of a variety of chefs on the DU campus to ensure that he can always find out the ingredients in every meal, or can have a safe meal prepared. He has taken on the responsibility for his own safety, and he ALWAYS carries two EpiPens with him. Morgan asked his roommate to not bring any of his food allergens into their dorm room. The roommate jokingly said, “I really wanted fish for breakfast!” His roommate has been extremely supportive, and we couldn’t have asked for a nicer young man to share a dorm room. Morgan has taught multiple friends about allergic symptoms and how to administer his EpiPen. He’s been on overnight camp outs with the leadership program he’s involved with, Pioneer Leadership Program (PLP); and made requests to the administrators of PLP for safe foods during these excursions. To date, he hasn’t had even one minor allergic reaction at school! Morgan became the Founder of the University of Denver Roosevelt Institute during his Sophomore year of college. This involved two trips – one to Los Angeles and one to New York – to prepare for his role as President of the organization. He wrote about each of these trips as a blog post. You can read about his Los Angeles trip here and his New York trip here. During his sophomore year of college, he was still required to live on campus. He lived with three other suitemates, and was able to secure a single room for himself. He still eats in the cafeteria, but does have access to a community kitchen. Because of the chance of cross contact with his allergens, he doesn’t feel comfortable making his own food in the kitchen. The chefs are so well trained about food allergies, he’s quite comfortable eating what they prepare. Morgan studied abroad in the Fall of 2016, during his junior year. He spent one month traveling through Iceland, Spain, France, Italy and Greece. Then one month was spent doing research in Copenhagen, Denmark. He then studied for one school quarter at the University of Lancaster in the UK. He made preparations for his safety for this trip from the start of college, but made it through all the countries safely and without any allergic reaction. He did go hungry a few times in order to ensure his safety, and we were thrilled with the support he received from his friends who traveled along with him. To read more about how Morgan prepared for study abroad and managed it while in other countries, please see blog posts here. Morgan also wrote an article for Allergic Living magazine about his experiences here. Additionally, he wrote an e-book, available on the Amazon Kindle platform to assist you and your student to prepare for study abroad with food allergies. More information is available here. Morgan has always lived BIG! 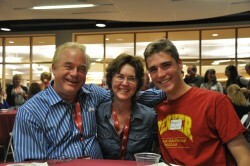 At the end of his junior year, he decided to run for Student Government at the University of Denver. 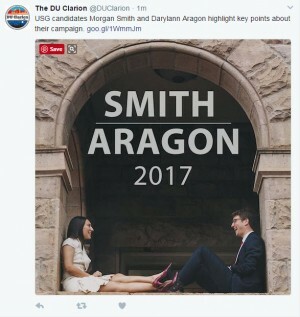 He and his teammate, DarrylAnn Aragon, campaigned for President and Vice President respectively. After a very active campaign, filled with heart and principle, they won! Being President involves many meetings, conferences, travel and more. And all of this can be done with preparation and vigilance around his food allergies! A long time ago, we gave up on the idea that Morgan will ever outgrow his allergies. Instead, we look for how Morgan can live as much life as possible always being cautious around his allergens. Morgan hasn’t had to withdraw from many opportunities, and we’d prefer to allow him to pursue his dreams and manage food allergies along the way. 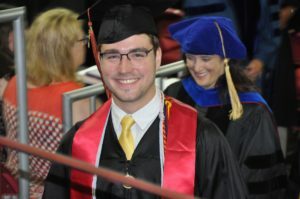 Now that he has graduated from college in June 2018, he’s out in the work world. 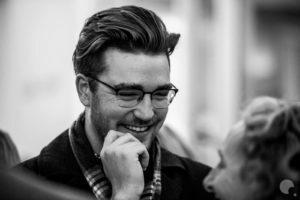 He double majored in Economics and Public Policy, and minored in Leadership and is now working for the Longmont, Colorado Economic Development Partnership as an Economic Development Specialist working on regional and local issues such as affordable housing, smart growth, and good local governance. His plans are to take the advocacy that he’s learned from living with food allergies and apply that to all areas of his life.